The Scottish indie pop band The Wake are often compared to New Order. Not only did they share the same label, Factory, but also they wrote sounds like this. The shimmering guitar of ‘Melancholy Man’ and muted vocals deserve to me remembered for much longer than they have been. The song featured on their sophomore album Here Comes Everybody. Have a great week. Before founding Shack, Mick and John Head were in the cult 1980s band The Pale Fountains. The title track off their Ian Broudie-produced second album …From Across The Kitchen Table is a rare 1980s gem. Impeccable kitchen-sink pop with a perfectly delivered female vocal hook in the remixed single version. Bliss. I mention Paddy McAloon in a post and I can’t leave the week without featuring Prefab Sprout. The band’s acclaimed sophomore recoding really stands the test of time, which is unusual for an album recorded in 1985. ‘Faron Young’, ‘Bonny’ and ‘When Love Breaks Down’ may get all the plaudits, but the graceful pop of ‘Moving The River’ kicked off Side 2 of the vinyl pressing perfectly. RIP Prince. One of his best. One of the best. ‘Pop Life’ is off 1985’s Around The World In A Day. Get it while it lasts on YouTube. Nick Drake lived in the Midlands village of Tanworth-in-Arden near Solihull. And that was north enough for this London band, who wrote ‘Life In A Northern Town’ as a tribute to the singer-songwriter. This David Gilmour-produced slice of 1980s dream pop appeared as the opening track on their self-titled debut LP. The single features a chant that would be sampled by Dario G a decade later for their pervasive dance track ‘Sunchyme’. Have a great week. 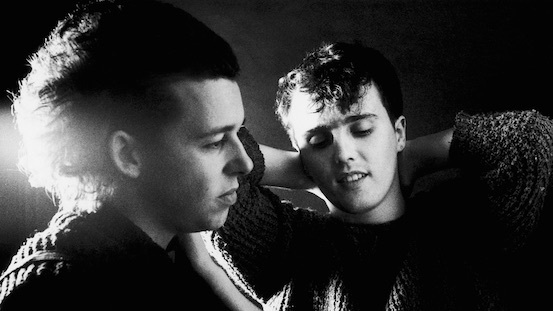 Some of Tears For Fears’ later music would jar, but they started out as an exceptional example of the electronic acts pulsating from the British shores in the early 1980s. So, before we leave 1983, I give you ‘Pale Shelter’, its synthesizers, acoustic guitars and angst-ridden lyrics. Have a great weekend. Back by absolutely no public demand whatsoever… 1980s. It’s 1985 and Lloyd Cole and the Commotions wrere riding on the success of 1984’s Rattlesnakes. While that album had been well received by critics and fans alike, the follow up Easy Pieces was one for the fans. Bass player Lawrence Donegan was described the album as terrible, which is harsh, particularly as it featured ‘Brand New Friend’, the closest they ever got to a hit single. 1985 was no high watermark in popular music, which makes Felt’s ‘Primitive Painters’ even more remarkable. Featuring on their album Ignite the Seven Cannons, the song is positively spellbound by the vocals of Elizabeth Fraser and the production of her Cocteau Twin, Robin Guthrie. Good morning. The upbeat ‘In Between Days’ was released as the first single from The Cure’s 1985 album The Head On The Door. It’s Monday. Have a good week. Good morning. The Cure never felt that ‘Close To Me’ was one of their best songs until they added a brass section, climbed into a wardrobe and released it as a single. It had originally featured without all of the above on their sixth studio album The Head on the Door. This was not the sound of a band on a cliff edge. Kate Bush played a gig at the Hammersmith Apollo last night – her first live concert for 35 years. I wasn’t there, but cause of your celebration nonetheless. ‘Wuthering Heights’ – too predictable. ‘Wow’ – too mad. ‘This Womans Work’ – too womanly. I plump for ‘Cloudbusting’, its hypnotic vocals and those instantly recognisable cellos. The prodigous Kate Bush and her rain-making machine off her classic album Hounds Of Love. Winston Riley, producer of Nancy’s Bam Bam (already featured on this blog), was also the architect of the Stalag riddim – the most sampled reggae rhythm of all time. Originally released in 1973 as the Ansell Collins track “Stalag 17”, the instrumental got its most famous makeover in 1985, when Tenor Saw decided to “Ring the Alarm”. One of dancehall’s finest. Have a good carnival weekend. Propaganda signed to Trevor Horn’s ZTT label and released the brilliant album A Secret Wish. ‘Duel’ followed ‘Jewel’ at the back end of Side A. The avant-synthpop track would be regularly remixed – most famously as ‘Jewelled’, which was used as the music for BBC’s World Rally reports. The original still sounds great – Susanne Freytag’s teutonic vocals are pitch perfect for the sound. There was quite an ado surrounding Prefab Sprout’s release of their album Steve McQueen in 1985. Thomas Dolby’s production managed to be both contemporary and timeless – no mean feat in the slick 1980s. I think much of it had to do with the subject matter – the lyricism of Paddy McAloon. On the second track ‘Bonny’, the front man successfully explores regret. So, between 1985 and the “Hot dog/Jumping frog/Albuquerque” of 1988, what went so awry? In 1985, The Cult’s long player Love reached out past their early goth fan base to excited rock fans around the world. Ian Astbury’s vocals and Billy Duffy’s guitar had been reforged to create a big spacious sound of Zep-like proportions. Guns N’ Roses formed that year and certainly took note. But, the likes of ‘Rain’ and ‘She Sells Sanctuary’ were immaculately and inconceivably recorded in leafy Farnham, Surrey – far, far away from la-la land. Have a great weekend.